THIS IS A FULLY QUALIFIED LINE MECHANIC POSITION – Line Mechanic level (with a minimum of one year experience at the fully qualified Line Mechanic level) including transmission work, work emergency, and planned overtime when the need exists; acquire a basic knowledge of the Company Safety Manual; have the mechanical ability to use hand/power tools, and equipment pertinent to line construction and maintenance; and have the ability to climb and work on poles, ladders, and other elevated structures. Position will require working both indoors and outdoors, and at times under adverse weather conditions. Selected candidate must meet the physical requirements as required by medical placement examination(s); this is a shift position therefore various work schedules will be required; employee must live within 30 minutes of the reporting location. The responsibilities will include, but not be limited to, clearing faulty and unsafe conditions, including maintaining or restoring electrical service, by temporary or permanent means to include bracing/lashing poles, securing pole tops, floating conductors, extending secondary, or as described below listed duties. The below illustrative duties will be performed as a single-person crew or as a multi-person crew as dictated by the task and applicable work methods. 3. Operate switching and control devices on both the overhead and underground systems (pad mounted equipment). 7. Perform streetlight repair work including replacing defective bulbs, photocells, and heads along with new installations. A high school diploma or equivalent, a valid driver’s license, and the ability to obtain/maintain a Commercial Driver’s License (CDL) are required. Individuals must be able to perform work assignments at the Line Mechanic level (with a minimum of one year experience at the fully qualified Line Mechanic level) including transmission work, work emergency, and planned overtime when the need exists; acquire a basic knowledge of the Company Safety Manual; have the mechanical ability to use hand/power tools, and equipment pertinent to line construction and maintenance; and have the ability to climb and work on poles, ladders, and other elevated structures. Job Categories: Featured. Job Types: Full-Time. 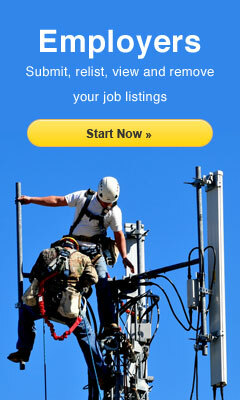 Job Tags: distribution lineman, journeryman lineman, journeyman lineman, lineman jobs, powerlineman, and powerlineman jobs.